Yayoi Kusama, Victoria Miro Wharf Road, until 30th July, free. 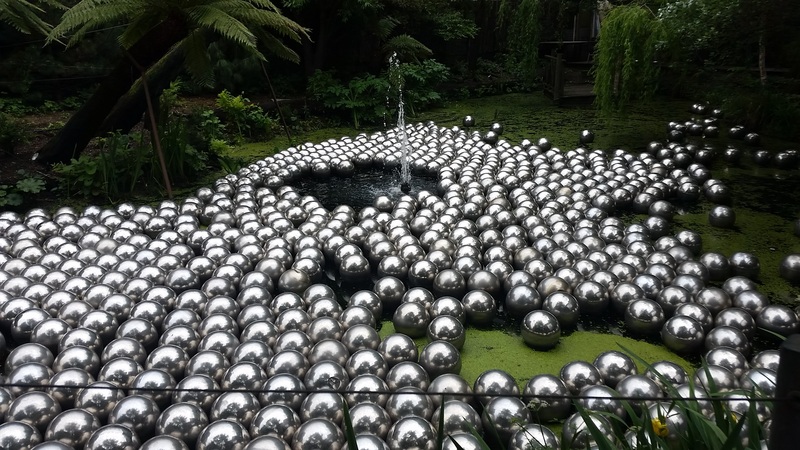 You may or may not have heard of Yayoi Kusama. Before going to this show I had heard of her, but I couldn’t have named anything she’d made. She’s certainly a lady with an interesting story. Born in Japan, associated with the pop artists and known as something of a hippy, then returning to Japan and voluntarily committing herself to a psychiatric hospital in 1977, where she’s lived ever since, continuing to create art. It’s a story with all the hallmarks of a sensational reputation – and indeed, apparently she’s a rather big draw in galleries. This was evident as soon as I arrived at Victoria Miro and saw the queue outside. It’s been a while since I had to queue for an art show, but this was clearly a ‘place to be’, the consequences of which I will discuss later. Kusama makes art to explore our ideas about the self, and in this show is using mirrors to reflect(!) this. She has created 3 “mirror rooms”, which I can best describe as walk-in boxes which use reflection to make their point. Headlining this article is a shot of the room All the Eternal Love I Have for the Pumpkins – the pumpkins reminding her of her rural childhood. The colour is warm and inviting and you could feel lost in the infinite stretch of pumpkins, but mostly I felt a sense of enchantment during my time in the room. chandelier created a rather gothic effect. This was probably heightened by the fact I’d gone to see Phantom of the Opera the day before, of which this was somehow reminiscent. Aside from the colours, did I feel grief in here? I certainly felt something large, and not altogether comfortable. Something similar may be said for Where the Lights in my Heart Go, the outdoor room, cleverly designed to let daylight in through holes and, well, it’s difficult to describe without being inside it. That last sentence feels like a cop-out but I feel that I have no choice other than to say that because of the biggest problem with this exhibition – its popularity. There were long queues to enter each separate mirror room and once in, you could stay for a maximum of 30 seconds. That’s not a very long time and, readers, I spent about a third of the time trying to make a photographic record for your consideration. That left 20 seconds to consider the virtues of the artwork. I feel like these rooms would mean something more if you had time to stay and really contemplate each one. Instead you just have time to fel a sense of wonder and maybe begin to touch on something deeper, before the door opens again and the effect is broken. This isn’t the gallery’s fault – they have to accommodate the large crowds in the best way they can, and each queue did move more smoothly than you’d guess it might from first looking at it. But it does spoil the effect somewhat. The installation you get to enjoy the most is Narcissus Garden, floating on the outside pond. With no queues I could take time to watch the balls float around the pond in whatever way the movement of the pond took them. You want to get closer to see yourself reflected in a ball, but then it floats away, denying you the chance to fall in love with your own reflection. Fate doesn’t work like that, and the water doesn’t have time to worry about your concerns. The more time I spent with this, the more I enjoyed it. It made me regret the crowds in the mirror rooms even more. There aren’t so many queues upstairs, where some of Kusama’s paintings are also being exhibited. The paintings are what first made her famous in the 1950’s: her ‘Infinity Nets’. Up close you can see how the strokes link together in a ‘net’ effect. Is it planned, or almost ‘automatically’ created? They certainly do have an undulating, psychedelic quality, but for me they didn’t make the same impact as the rooms downstairs. More of her paintings are on display at Victoria Miro’s second gallery in Mayfair which I would have been interested in also seeing, but I had run out of time for today. Damn those queues. This entry was posted in Exhibitions, Home, On my travels, Past exhibitions and tagged art, culture, London, mirrors, modern, pumpkins, Yayoi Kusama. Bookmark the permalink.